We’d love your help. 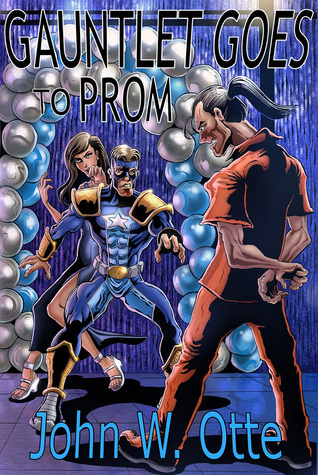 Let us know what’s wrong with this preview of Gauntlet Goes to Prom by John W. Otte. YA SUPERHERO FICTION at its best! Ben Laughlin has faced some scary situations. After all, he's a teenage superhero, known to the world as the powerful Gauntlet. But taking his girlfriend, Elizabeth Booth, to the prom? It’s too bad he can’t go in costume. Ben wants this to be more than just one dance, one night. He has big plans that extend beyo YA SUPERHERO FICTION at its best! Ben wants this to be more than just one dance, one night. He has big plans that extend beyond the dance floor and could very well change his entire life. But life as a superhero is never simple. To ask other readers questions about Gauntlet Goes to Prom, please sign up. A superhero's life can be a funny thing. Saving the world one moment. Asking your girlfriend to prom and applying to college the next. In Failstate, we got to see how Robin Laughlin (aka Failstate) sees both the world and his super-debonair superhero older brother, Ben (aka Gauntlet). But in Gauntlet Goes to Prom, we get to hear the story from Gauntlet's point of view. At approximately fifty pages, Gauntlet Goes to Prom sets the stage for the next book in the series, Legends, but it's also a comp A superhero's life can be a funny thing. Saving the world one moment. Asking your girlfriend to prom and applying to college the next. In Failstate, we got to see how Robin Laughlin (aka Failstate) sees both the world and his super-debonair superhero older brother, Ben (aka Gauntlet). But in Gauntlet Goes to Prom, we get to hear the story from Gauntlet's point of view. At approximately fifty pages, Gauntlet Goes to Prom sets the stage for the next book in the series, Legends, but it's also a complete adventure in its own right. I always enjoy getting a look at my favorite characters from a different character's view-point. So it was fun getting to see Failstate through Gauntlet's eyes. And just plain fun to know what was going on in Gauntlet's slightly conceited mind. Gauntlet was a major supporting character in the novel Failstate and here he gets his own story. As implied he's going to his prom with his girl looking forward to giving her a promise ring. But even as they make his plans, something is afoot. And why does his dateless brother show up as Failstate. The big brother of the star of the Failstate books is a character in himself: slightly vain and egotistical, yet with a tender side. It's fun to see him squirm and feel his nerves as he tries to broach Gauntlet was a major supporting character in the novel Failstate and here he gets his own story. As implied he's going to his prom with his girl looking forward to giving her a promise ring. But even as they make his plans, something is afoot. And why does his dateless brother show up as Failstate. The big brother of the star of the Failstate books is a character in himself: slightly vain and egotistical, yet with a tender side. It's fun to see him squirm and feel his nerves as he tries to broach the big question. The story itself is not without issues. The explanation of most of the villainous conflict is somewhat anti-climatic and the world-changing event for Gauntlet at the end of the book strains credulity. However, the superhero genre tends to do that, so that can be forgiven. Seeing things from Gauntlet's perspective was really interesting, especially how he sees Failstate. I really enjoyed this read. The writing was tighter (and the proof-reading was definitely better) than in "Failstate." I really like these characters and storylines, and I'm looking forward to starting the next book ("Legends") as soon as my daughter gets done with it. This is a great little Failstate novella told from Gauntlet's point-of-view. I loved this extra short. It's a complete story that stands well on its own, and the quality is excellent. It was nice to see Gauntlet's take on what has happened in the story so far. It made him much more likeable. And readers of Failstate all know how our hero sees himself, but It was rather wild to see how others saw him - namely his older brother. Quite a difference indeed! What else am I going to give this? I mean, really?